When you’re a famous artist people will do anything to see your works. Anything, even attend an event about you that you never planned. That seems to be the moral of the story that’s to be learned when you hear about how Banksy was going to have six exhibits about his works before the year ends. Four already happened, one is having slight legal issues, and one more is on the way. The catch? He doesn’t have anything to do with it. Yup, nothing. Nothing at all. He’s not going even to see a single cent of the proceeds these events will generate. The organizers know that Banksy will never endorse these exhibits, primarily because these exhibits charge their visitors when Banksy himself would never ask money from the people who’re going to see his works (unless he has a reason to charge them). But can Banksy even complain? He, too, is a master of “doing stuff to other people’s stuff without their knowledge” after all. The first event on our list happens in Russia. One of his followers sent him an image with his name on top of some building. He asked his follower the details and told him that it’s an exhibit of his works in Russia and how the organizers were asking for money and make it look like it’s legit. 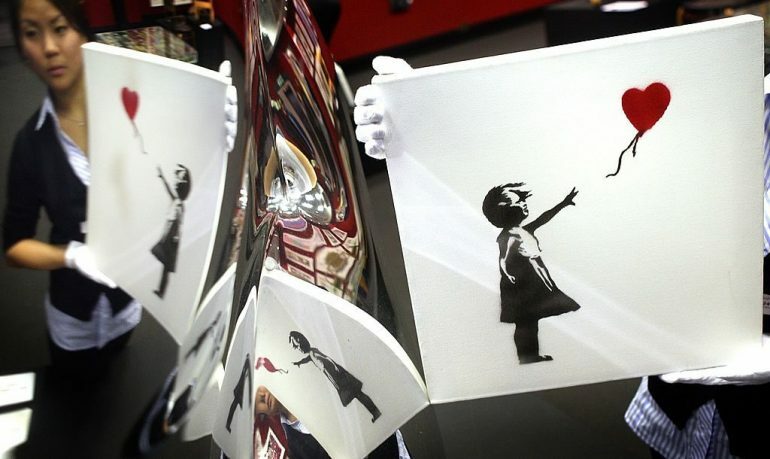 The show in question, titled, “Banksy”, has over 100 works created and photos taken by the artist himself. The event has been planned since 2014, but some art owners refused to lend critical works to the exhibit. Russians are not the only ones who seem to think they can do whatever they want with Banksy’s art. Being his former manager also makes you eligible too. At least this is what Steve Lazarides believes so, since he has exhibited Banksy’s works in Tel Aviv and Toronto already this year, and is planning to fly to Miami next. Of course, this is all without Banksy’s permission as well. And this one is even more shameless when it comes to pricing: £27 to £35 a ticket ($35 to $45). Finally, something weird happened to the unauthorised Banksy show that supposed to go live in Belgium. The story begins when Steve Lazarides also launched an unofficial Banksy show in Berlin with the help of a company known as On Entertainment. On Entertainment wanted to bring the exhibit to Brussels, and with the help of a company called Strokar Inside, they managed to launch a show in the former Delhaize supermarket. Then on Thursday night last week, the Belgian court had the works seized because, they reasoned out, that On Entertainment overstepped their bounds. Strokar, which is caught in the middle, bailed out of the situation until On Entertainment could iron out their dispute with Steve Lazarides. In short, Steve Lazarides is accusing someone of launching an unauthorized show, which is part of his chain of unapproved shows. Whether Mr Lazarides is aware of his hypocrisy or not is not mentioned. 1st Image: A version of Banksy’s Girl with Balloon, via artnet. 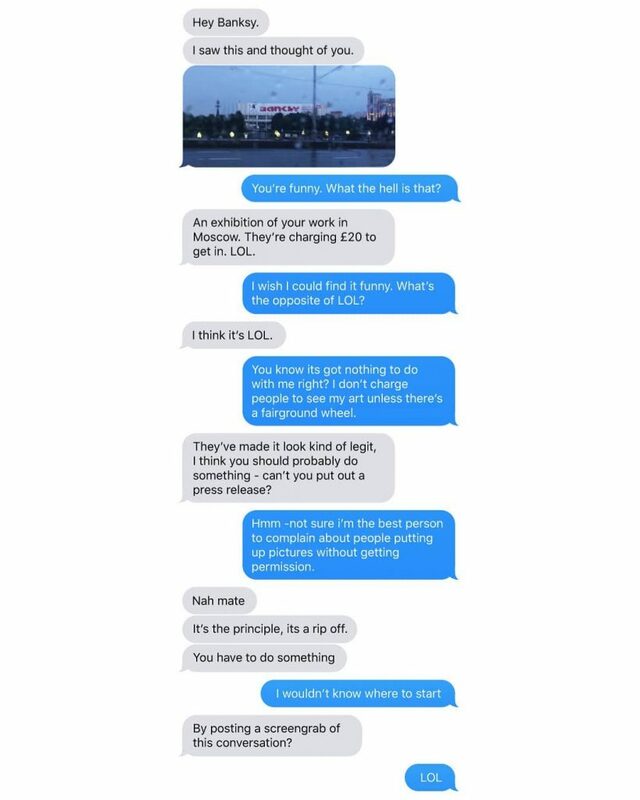 2nd Image: Banksy’s chat with a fan, via his Instagram.